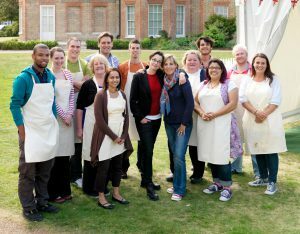 Lately, I have become obsessed with a television programme on BBC2 – The Great British Bake Off. It combines two of my favourite things, baking and Britain – so what could be better?! Anyway, the premise of the show is that they are looking for “the best amateur baker in Britain”, starting off with a cast of 12 bakers and eliminating them weekly in 1’s and 2’s. The bakers participate in three challenges throughout the show – a signature bake, in which they show off their “signature” item in a category, a blind bake, where everyone bakes identical recipes assigned by the two judges (this is to measure technical skill), and finally, a showstopper bake, which is meant to impress the judges. There are little historical segments interspersed (my favourites were about Henry VIII’s kitchen devoted solely to tarts, and the the bit about how bakers made all sorts of crazy substitutions during WWII rationing). The signature and showstopper bakes tend to produce some pretty creative (and delicious) items, which I then recreate in my own little test kitchen. My favourite baker, who is still on the show, is Mary-Anne, because her recipes are almost always innovative and different than her competitors’, and she has a massive cookbook collection. Anyway, if you live someplace where you can get BBC2, I highly recommend giving this show a try. There is only one episode left in the season, but you can get all of the older eps on iplayer. And some of the recipes are available on the BBC website.